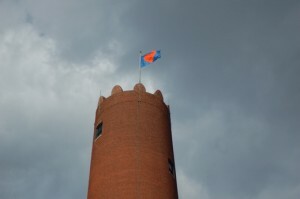 One pre-recorded music composition played from speakers mounted underneath the ceiling of the shot tower, loud enough that viewers on the first and second floors could hear it. Another composition played from speakers placed on the rooftop of the tower, loud enough for migrating birds to be serenaded. I used the inherent non-objectness of sound as a means of critiquing the forces of reification, gravity, friction and freedom as they function within our systems of production and human understanding, using the unique structural conditions of this birthplace of bullets as a starting point. Sound falling on the ears of viewers inside, sound flying up to meet the birds. Heavy and weightless.